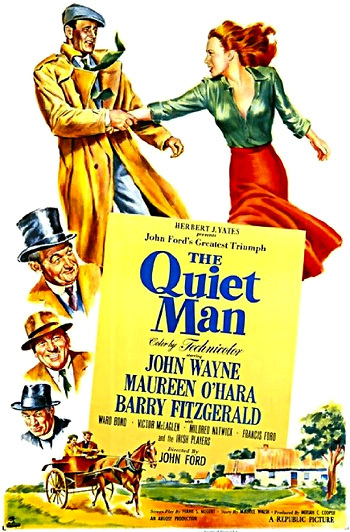 The Quiet Man (1952) is director John Ford's epic romantic comedy - a loving, sentimental, nostalgic tribute to his Irish ancestry and homeland. A rich, beautifully-textured Technicolor presentation deserving of its Color Cinematography award, it was filmed mostly on location in Ireland, although some backdrops and background studio shots were obviously intermixed. Its screenplay was based on Frank Nugent's adaptation of Maurice Walsh's Saturday Evening Post 1933 short story Green Rushes. Ford considered the rollicking, comedy love story one of his favorite films. The memorable plot was about the collision course between an anti-materialistic, Irish-American boxer nicknamed 'Trooper Thornton' (Wayne) in the town of Innisfree in the land of his Irish birthplace and a local, mean bully (McLaglen). They became further entangled when he fell in love with the man's fiesty, red-haired, materialistic sister (O'Hara) who refused to consummate her marriage without her dowry (350 Irish pounds in gold). The story was inspired by a Celtic myth about a monumental battle between two sacred kings (gods) who annually fought for the affections of a queen (or goddess). The famous director of westerns had already won Best Director Academy Award Oscars for three previous non-Western films - The Informer (1935), The Grapes of Wrath (1940), and How Green Was My Valley (1941). This sentimental film, Ford's first 'romantic love story,' received a total of seven Academy Awards nominations (including Best Picture, Best Supporting Actor - Victor McLaglen, Best Screenplay - Frank Nugent, Best Art Direction, and Best Sound) and won two Oscars: Best Cinematography - Winton Hoch and Archie Stout, and Ford (at 57 years of age) won his fourth and final Best Director Oscar, establishing a record that is still unbeaten. In the seventeen years of Republic's existence, it was the first film for the studio that was nominated for Best Picture. Because the film was an ambitious, personal pet project and not one of Ford's typical westerns, he was unable to find financial backing from the major Hollywood studios, so he turned to Republic Pictures, a smaller studio regarded as the studio for B-pictures and low-budget westerns. After the financial and critical success of Rio Grande (1950) for the studio, the third of Ford's 'cavalry trilogy,' he convinced Republic Pictures to support him for his next riskier film - an Irish "Taming of the Shrew" tale that was remarkably similar in plot. He brought the same stock company of actors from his western - John Wayne, Victor McLaglen, and Maureen O'Hara - to Ireland to film his humorous, epic romance. It has been said that John Wayne represented John Ford on-screen as a younger 'alter-ego' of the famous American film director. [Note: Ford was born Sean Aloysius Feeney/O'Fearna in 1895 in Maine, the youngest son of an Irish immigrant who had 13 children.] It is probably not just coincidence that Maureen O'Hara's character name is Mary (Ford's wife's name) Kate (the name of his unrealized love - Katharine Hepburn). Ford also cast his brother Francis (a silent film actor and director) in a cameo role as patriarch Dan Tobin - an ailing, white-bearded elderly man who refuses to die before witnessing the donnybrook fist fight in the finale. Now, I'll begin at the beginnin'. A fine soft day [Irish for 'it's raining or misting'] in the spring it was when the train pulled into Castletown three hours late as usual, and himself got off. He didn't have the look of an American tourist at all about him. Not a camera on him. And what was worse, not even a fishing rod. Don't you remember Seannie and how it was? The road led up past the chapel and it wound and it wound. And there was the field where Dan Tobin's bullock chased you. It was a lovely little house, Seaneen. And the roses! Well, your father used to tease me about them. But he was that proud of them too. Sean: Do you think she'd sell it? Sean: Don't bet on it, 'cause I'm buyin' it. Michaeleen: Now why would a, why would a Yankee from Pittsburgh want to buy it? Sean: I'll tell you why Michaeleen Oge Flynn, young small Michael Flynn who used to wipe my runny nose when I was a kid. Because I'm Sean Thornton and I was born in that little cottage over there. And I've come home, and home I'm gonna stay. Now does that answer your questions once and for all, you nosy little man? Michaeleen: Seanin Thornton! And look at you now...What do they feed you, all you men who are in Pittsburgh? Sean: Steel...Steel and pig iron furnaces so hot a man forgets his fear of hell. When you're hard enough, tough enough, other things, other things Michaeleen. Father Lonergan: Ah yes, I knew your people, Sean. Your grandfather - he died in Australia in a penal colony. And your father, he was a good man too. Bad accident that. And your mother? Sean: She's dead. America, when I was twelve. Father Lonergan: (piously) I'll remember her in the mass tomorrow, Sean. (sternly) You'll be there, seven o'clock. Sean: (rhetorically to Michaeleen about his distorted perceptions) Hey, is that real? She couldn't be. Michaeleen: Oh nonsense, man. It's only a mirage brought on by your terrible thirst. To put an end to the imagined mirage, Michaeleen drives them to Innisfree's local pub/bar, run by publican Pat Cohan. Early the next morning, Sean kneels in the Catholic church. A floor-level camera angle frames the colorful stained-glass windows at the end of the nave and above the altar. Sean exits down the nave toward the camera, passing the sheepherder lass kneeling in another pew - she looks after him. [Later, Sean tells her that her face was "like a saint."] Following the Catholic mass, Sean waits outside at the back of the stone chapel where the red-haired woman follows. No longer in doubt about her, he removes his hat, abruptly scoops up ecclesiastical holy water in his palm, and greets her: "Good morning." Without a word, she dips her fingers in the water in his hand, makes the sign of the cross with the water, and hurries off - it is a formal, spiritual encounter. Michaeleen: None of that now, none of that. It's a bold sinful man you are, Sean Thornton. And who taught ya to be playing patty fingers in the Holy Water? Sean: Just bein' polite, that's all. Michaeleen: Maybe you don't know it's a privilege for courtin' couples and then only when the banns has been read. And Mary Kate Danaher dippin' her fingers in as neat as you please. Sean: What did you say her name was? Michaeleen: Mary Kate Danaher. Now don't be gettin' any notions in your head...Forget it, Sean, forget it. Put it out of your mind entirely. Sean: Why, what's the matter? She isn't married or anything, is she? Michaeleen:...No...and her with her freckles and her temper. Oh that red head of hers is no lie. Still, a man might put up with that, but not with her lack of a fortune. Look, Mrs. Tillane. I'm not talkin' about memorials or monuments. It's just that ever since I was a kid livin' in the shack near the slag heaps, my mother's told me about Innisfree and White O'Mornin'. Innisfree has become another word for heaven to me. When I quit the...when I decided to come here, it was with one thought in mind. Danaher: Is it true...that behind me back the White O'Mornin' right from under me nose? Tillane: And what concern of yours is this, Will Danaher? Danaher: Concern? Concern enough. Haven't I made you a good fair offer for that same piece of land? And mine, lying right next to yours. Tillane: You may keep your offers. Danaher: Oh, so it's true. You've sold it. Tillane: No, I have not. Danaher: (after a boisterous laugh) I knew it was a dirty lie the very minute I heard it. Sure. I said to him, 'Paggy McFarland, you'll never make me believe that Sarah Tillane will be selling White O'Mornin'. Why, it would be like building a fence between your end and mine for a stranger to move in,' says I. 'And what would she be doin' that for? And us so close to an understanding,' you might say. Tillane: So you told him all that, did you? Tillane: Down at the pub, I suppose, in front of all those big ears with pints in their fists and pipes in their mouths. You may have the land, Mr. Thornton, for six hundred pounds. Outbid, the dismayed and angered Danaher vows that Thornton will be his enemy: "I've got you down in my book." Mary Kate: Good for Widow Tillane...After all, he's [Sean Thornton] got more right to that land than you have. Danaher: He'll regret it till his dying day, if he lives that long. In the pub, Sean samples one of the "black beers," and offers to buy a round of drinks for everyone. But his generous offer of kinship is met with cold silence and suspicious stares - until the 'tall man' is befriended by long white-bearded old-timer Dan Tobin (Francis Ford, director John Ford's estranged brother). The bartender removes his hat in an awed response to a recitation of Thornton's lineage. The patriarch remembers his father Michael and grand-father Sean: "Bless his memory. So it's himself you're named after. Well now, that being the case, it is a pleasant evening and we will have a drink." He pounds his walking stick on the bar, as Dermot Fahy (Ken Curtis) starts playing an Irish ballad - "The Wild Colonial Boy" on his accordion for all to sing. There was a wild colonial boy, Jack Dugan was his name. And dearly did his parents love this wild colonial boy. He's a nice, quiet, peace-lovin' man come home to Ireland to forget his troubles...Sure, yes, yes, he's a millionaire, you know, like all the Yanks. But he's eccentric. Oh, he is eccentric. What till I show ya...His bag to sleep in, a sleeping bag, he calls it. At the early age of sixteen years, he left his native home. And to Australia's sunny shores, he was inclined to roam. He robbed a wealthy squireen, all arms he did destroy. A terror to Australia was this wild colonial boy. Danaher: Neighbors? Oh, neighbors. NEVER! And if I so much as catch you putting your wet foot on my property...and oh, another thing, you keep away from my sister Mary Kate. She's not for the likes of you. Thornton: Where I come from, we don't talk about our women folk in saloons. You sort of make a habit of it. Their conversation turns ugly in the pub when the cantankerous Danaher is called a liar for suspecting that Thornton "took liberties that he shouldn't have" at the back of the chapel - Sean's "Good Morning" wasn't genuine - according to Danaher: "it was Good Night" that he had on his mind. The two are commanded by Father Lonergan to shake hands - their extended handshake turns into a combative, iron grip as they painfully squeeze each other's hands as tightly as possible. They both wince during their first physical display of competitive manhood.